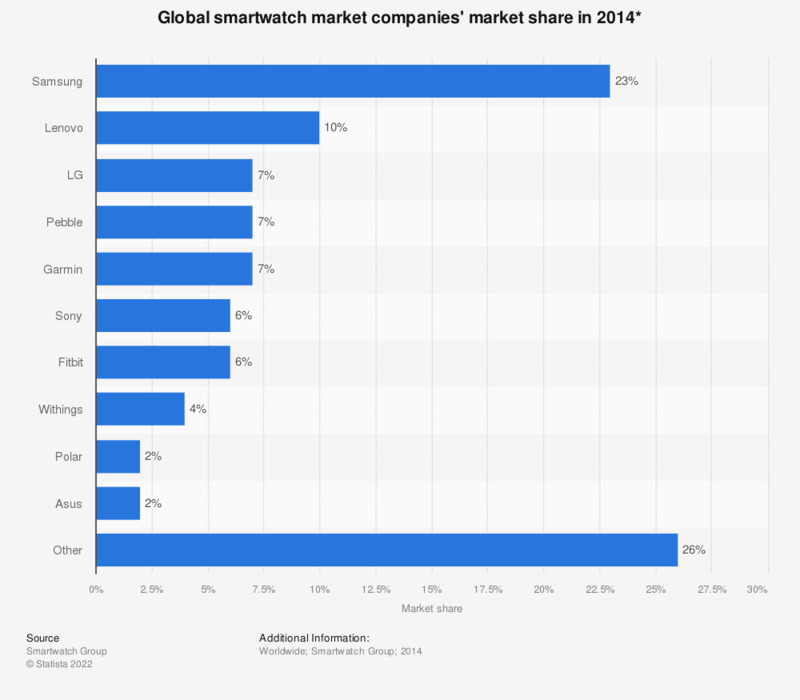 The statistic shows a market share breakdown of the global smartwatch / consumer wearables market in 2014. Samsung's share of the smartwatch market was 23 percent. The wearable technology industry is a new and expanding market, with rapidly growing revenues and innovative new players entering the market. The revenue of the global wearables market stood at almost 1.5 billion U.S. dollars in 2014 and is expected to grow to 5.8 billion U.S. dollars in 2018. Wearable products include smart glasses, hearables, smart health devices, smart watches and fitness trackers or even smart jewelry and clothing. Smartwatches are devices worn around the wrist that feature a vast array of functions, aside from time-telling. They can collect data from the wearer’s body or environment, such as heart rate, calorie consumption, and blood pressure or outside temperature. Additionally, they can connect via Bluetooth to a smartphone and perform a number of actions, like GPS navigation or video-calling. According to forecasts, almost 25 million smartwatches will be sold in 2015 worldwide, 7.4 million units in North America alone. The revenue of smartwatch sales is predicted to reach 3.1 billion U.S. dollars in the United States in 2015. As of 2015, the leader of the smartwatch market is Samsung. Other important players are Pebble, Fitbit, Sony, Lenovo and LG. With the introduction of the Apple Watch at the beginning of 2015, Apple is expected to also become a strong competitor in the near future. A total of 89 companies debuted smart watches in 2014 and many more are expected to bring smartwatches to the market in 2015.